Home » 3-d , george lucas , movies , reviews , star wars , the phantom menace , what the hell were they thinking » STAR WARS EPISODE I in 3D gave Chris a splitting headache! STAR WARS EPISODE I in 3D gave Chris a splitting headache! So yesterday evening, my lifelong best friend Chad and I met up in Durham to do something we had never done before. For all the things we've done together, we had yet to see a Star Wars movie together in the theater. Okay, we've done that now. I'm thankful that we got to fix that. But that's the only good thing that came out of last night's screening of Star Wars Episode I: The Phantom Menace in 3D(?!?). Now I have to be honest: there are some parts of the movie that look far better in 3D than they deserve to be. The podrace sequence, f'rinstance. But I'm inclined to believe that's only because it's already moving so fast that your eyeballs are being vicariously assaulted before your gray matter gets time to register the sensation. Unfortunately a movie consumed with things like boardroom meetings and bureaucratic theatrics makes the 3D a tedious thing to sit through. That's when the 3D works at all. Because there are loads of times during Star Wars Episode I's 3D edition that the 3D isn't there to begin with! Trust me folks, I took off my 3D specs a number of times during the second half or so of the movie and, I couldn't tell ANY difference at all between the 3D conversion and the 2D original that I have seen about 9 times already on the big screen. And then there is what was likely the most significant reason why my visual cortex felt burnt afterward: the schizoid use of 2D and 3D elements simultaneously. I saw plenty of that during the Coruscant scenes in particular before giving up and letting myself just watch the darn thing. 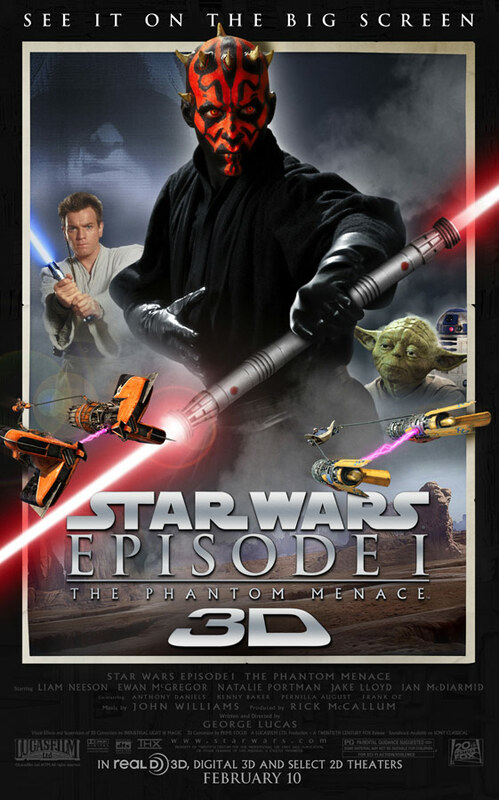 The Phantom Menace in 3D adds nothing particularly enjoyable to the experience of watching a Star Wars movie in theaters... and that's something that I've never had happen to be before, in over thirty years of going to see Star Wars flicks at a cinema. Taking a movie shot in standard 2D and converting it into 3D has proven time and time again to be an expensive and glorious mess. I had hoped, sincerely hoped, that Star Wars Episode I would be the breakthrough movie that put an end to the never-ending parade of 3D post-production disaster. Heck, we've known this was coming for years before Avatar ever came out. In Industrial Light and Magic did I trust. But no, I cannot recommend Star Wars Episode I: The Phantom Menace in 3D. Neither can I see myself going to any of the other Star Wars movies set to be released in 3D, one a year for the next five years. Now if George Lucas wants to produce a new Star Wars film trilogy, and actually shoot them in true honest-to-goodness stereo camera setup THREE DIMENSIONS, I'll gladly see those in the theaters a dozen times over. But turning 2D into 3D? Who'da thunk that I'd leave a Star Wars movie... any Star Wars movie... cringing about having watched a steaming pile of bantha poodoo. I guess Chris saw a different version than I did. The version I saw was excellent - a vast improvement over the original. I bet the person above has never seen a Star Wars movie in its life. Great review Chris. TPM 3D hurt my eyes too. It saw Phantom Menace and the five others. It thought it was great in 3D. It looking forward to the others in 3D. Sorry you and Chris won't enjoy them. I have yet to find ANYONE who is happy with the 3D conversion work on The Phantom Menace. At this point I am leery of how Titanic will look in 3D, even considering that it is James Cameron - who spent ten years developing the DEFINITIVE 3D technology on Avatar - who is personally overseeing that effort. Face it: conventionally-filmed 2D movies do NOT make for any respectable kind of 3D version. It just isn't optically possible with current dominant technology. The up-and-coming lightfield cameras are said to be able to pull it off with ONE lens, but that's an entirely different thing altogether.